Almost a year ago Marcus and I headed out to check out some marks in the hope of finding something new to dive. Our plan to survey three or four sites that day was cut short by inclement weather, however the time we had yielded some success; the echo revealed something standing 3m proud of the seabed at a depth of eighty meters near to the first mark. We trawled backwards and forwards for an hour or so marking waypoints every time we got a hit, hoping to build up an idea of how big the thing might have been – this gave us an estimate of forty to fifty meters, although bouncing around in rough seas in a small rib didn’t give us too much confidence in the accuracy of the results! Old reports described Nevil Adkins and Tim Seed diving on ‘Robert’s Barge’ in a location and depth that seemed to match this site, although no position had been listed in the account. Was this the same barge? Or something new? Whatever it was, it certainly looked like it was worth a dive. Almost a year passed until this April when I put a plan together with some other members of the Ras Al Hamra Sub Aqua Club to head out and dive the site Marcus and I had located previously. Despite being favoured with very respectable visibility during the descent, towards the seabed it became a bit milky and so we were at nearly 70m before the outline of an open pipe barge, completely empty and sitting upright on the silty seabed, loomed into existence below us. Any ambiguity as to whether the site was the same one dived by Nevil and Tim was definitively dispelled as they’d left a can with an inscription attached to a ladder at the stern. Tim and Nevil’s claim on the wreck: ‘Welcome to Robert’s Barge. 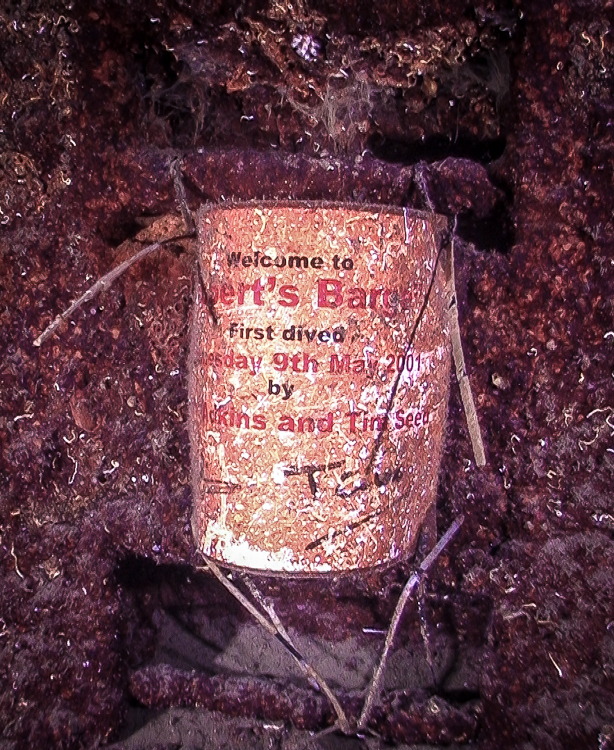 First dived Wednesday 9th May 2001 by Nevil Adkins and Tim Seed’. The site is small (smaller than the echo suggested) and dark but eerily beautiful. 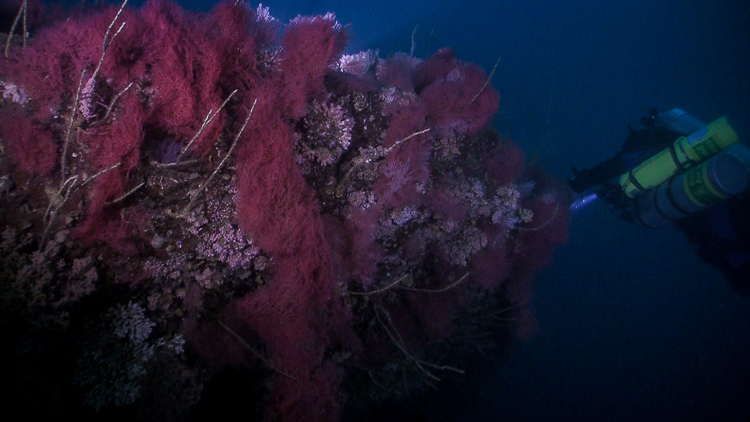 Sunk forty years previously and having only been dived once to date (to the best of our knowledge) it was also well colonised and undisturbed. Given the depth we only had a brief bottom time to get the shots for the video, which is correspondingly short, but I’m sure you’ll agree has a haunting beauty. P.S. Apologies for the quality of the stills in this post – they are frame grabs from the video footage.